If you’ve been lucky enough to see the new Teclast M89 tablet, you’ll have noticed how eye-catching it is from the onset. Whoever is in charge of package design has a lot of teaching that other smart-devices manufactures should hire them for. The contrasting yellows and white accents that hit the eye when you glance it are nothing short of amazing! Let us take you through our unboxing, setup and one week of usage experiment while we learned how good the Teclast M89 really is. What more would you need, really? The Teclast M89 comes stock with a 2K screen, something that you’d better off experience without the thin plastic film that comes attached to the screen upon opening. We don’t know your preferences, but really who needs that plastic covering especially when it doesn’t offer any more protection than just dust and dirt to the main screen. Yeah, we peeled that thing off like we do with all other devices for best response rates to the touch. At 7,9 inches, and 2048×1536, the IPS hard screen’s resolution stands toe to toe with that of the much-acclaimed iPad mini that comes with 326 pixels per inch. Impressive stuff for a machine that’s running on the Android mobile operating system. something to note as you look at it directly is the fact that there is no physical home button, you have to settle for the onscreen home button. What you see is the camera, which states directly forward it is unmissable. Perhaps one of the most important things for most selfie-addicts nowadays is the front camera. If you’re buying the Teclast M89 with intentions to take a lot of selfies or even host video calls, go right ahead – the 5 million pixels that come by default with the front-facing camera make it all the more worth having. Flip the Teclast M89 over and you will see another camera, and at a better, 8 million pixels compared to the front one, the possibilities are endless! To note is the fact that the makers of the Teclast M89 stuck with the no-raise architecture of the camera; we think it will stand a couple of falls more than the new kind of design. Makes sense since the back of the Teclast M89 will predominantly be lying on surfaces that we wouldn’t want to damage the camera. While we’re still looking at the back side of the Teclast M89, one won’t help notice the gold color with a smooth no-fingerprint finish that we couldn’t resist giving a couple of rubs. Remember the controversy that arose when the iPhone 7 was released; the issue about earphone jacks and how people complained about it to be reinstalled on the smartphone? Well, those shenanigans won’t happen with the Teclast M89. On the top of the device are the jacks, Type-C data cable connection input, the much needed 3.5mm headphone jack, and a Micro-HDMI output port that extends the Teclast M89’s screen on to larger viewing options when necessary. We especially love this added port, perfect for gaming and even better for business presentations. The Teclast M89 comes standard with volume control buttons fixed on the right side of the gadget. Just below the volume controls if the power button. 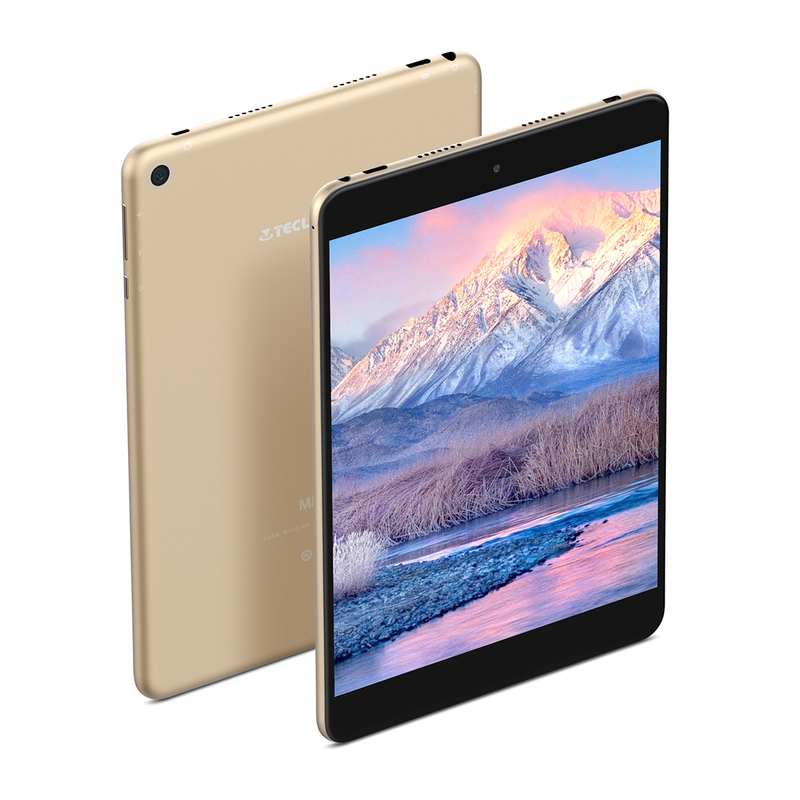 A clean and straightforward design that we think matched the rest of the tablet’s anatomy. Storage Space and Expansion Options. First of all, unlike the trend nowadays that smartphones come with onboard memory and there is basically nothing else you can do to add to that capacity, the Teclast M89 was humble enough to allow memory expansion. That deserves an applause. However, given that it comes with an impressive 32GB storage by default, there are very few of us who would require more. Think of it this way; we used to go by our lives with just a 2GB memory card, so life shouldn’t be so hard with fifteen-times that. For argument’s sake, if you really must expand the Teclast M89’s memory capacity, feel free with the maximum capacity extendable being 128GB of SD type. Most people will do this, we figure. Not that many people are really concerned but the Teclast M89 packs a punch, so much that many reviews have called a tablet PC. Brace yourself, it has a Hexa-Core 4×1.7GHz processor with an ARM Cortex-A53 + 2x 2.1GHz ARM Cortex-A72 CPU Clock; that running on a MediaTek MT8176, 64-bit Processor. For gamers, the IMG PowerVR GX6250, 700MHz GPU should do just fine running any top-tier android games currently on the Play Store. The 3GB RAM is also something to note as it is better than most big brand wearing personal computers. In a nutshell, the Teclast M89 can do pretty much everything that a powerful notepad is expected to do. Play high definition movies, document creation and editing with appropriate apps, play games with a fast screen refresh rate and guarantee some great entertainment. Okay, now let’s focus on what really matters, the user experience. 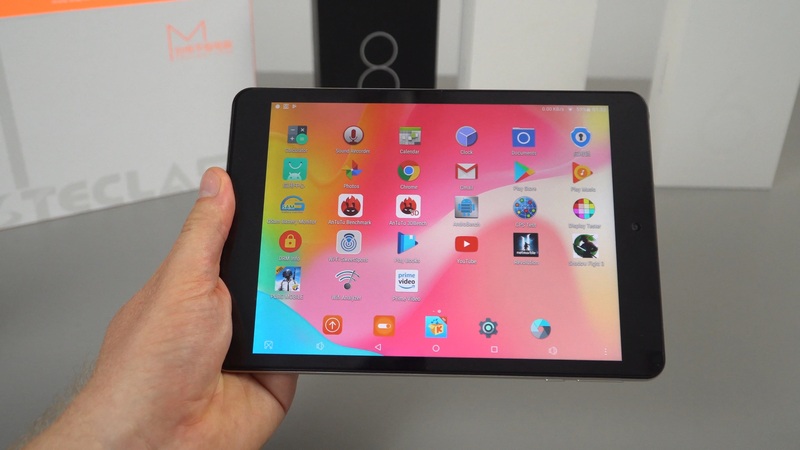 Having reviewed some other devices that boasted bigger price tags and even bigger specifications sheets, the Teclast M89 stands out as being capable of negotiating cost with performance. For a device of its cost range, the Teclast M89 packs a punch, only proving that when you look close enough, and beyond the asking cost or even brand reputation, a gem is often just waiting to be found. The Teclast M89 comes running on Android 7 Nougat operating system for smartphones and tablets, which inherits the Google Suite of apps and their respective performance thresholds. This implies that someone looking to use the device for entertainment purposes only needs a Gmail account to unlock the Teclast M89’s full potential. From downloading games to using mail services. Like we mentioned before, the screen resolution is something that the Teclast M89 quietly boasts with awesome graphics performance when playing games. There couldn’t have been a better place and people to review the Teclast M89 to that end. We took turns downloading our favorite game titles from Google’s Play Store and exerting ourselves as much into their gameplay as we could. And we were not disappointed. Racing games were easy to be rendered right on the screen of the Teclast M89, with hours of fun passing very quickly. Shooting games were also used to test the responsiveness of the screen to unpredictable control commands. What we discovered, as anyone else that has played such titles on tablets, is that the aim is much better when imposed on a large screen display. Which again the makers of the Teclast M89 knew very well, allowing the output of the screen to any compatible screen, thanks to the Micro HDMI port. The same can be said for the movie experience unless you are mobile and need a quick fix of your favorite television series on the go, the 2K display screen won’t gives you the best quality. Otherwise, on the go, you can play hours of content and actually enjoy the experience, like we did. It is cheap. You get value for your money. The graphics are amazing for gaming and entertainment. We loved the Mini HDMI port; device screen expansion to a bigger screen is a huge selling point. The on-device speakers are amazing! The Android version is a little outdated, which means fewer apps will be compatible. Must connect to a bigger screen with high-end shooter games. A little chunky, almost half a kilo. Could work better with Sim Card Support for calls. 8 Mpix back camera could have been improved. Would we buy the Teclast M89, oh definitely. Not because we like inexpensive devices, no. This particular smart device can stand in as a gaming console and personal computer. That’s if we require one on the go. That and the fact that has the coolness factor working in its favor. Buy Teclast M89 on Gearbest for only $149.99Best Deals On Gadgets First!